Just a few weeks ago Intel decided to change things up with its naming schemes and introduced Pentium Gold CPUs, comprised of the existing "Kaby Lake" Pentium lineup, including the highly regarded G4560 and G4620. Today, Intel is continuing its elemental naming scheme with the launch of Pentium Silver for more basic CPUs based on the "Gemini Lake" architecture alongside the legacy of Celeron processors. The new processors include one Pentium Silver and two Celeron processors each with a mobile and desktop variant. Starting at the bottom and working our way up, the mobile Celeron N4000 has two cores and two threads with a maximum frequency of 2.6 Ghz. Intel UHD Graphics 600 gets a 650 MHz dynamic frequency. The desktop variant Celeron J4005 receives a bump in clock speed to 2.7 GHz and 700 MHz for the integrated graphics. Across the board, all six new CPUs run with dual channel memory at 2400 MHz and each has 4MB of cache. The Celeron N4100 only reaches 2.4 GHz but has four cores and threads followed by the Pentium Silver N5000 that is capable of hitting 2.7 GHz. Intel Pentium and Celeron processors are intended for use in computers built to handle regular everyday tasks and not highly demanding workloads. Compared to the Pentium Gold CPUs that have Hyper-Threading, Silver and Celerons don't but should also become available for modest prices. A new addition in this lineup is a display technology "Local Adaptive Contrast Enhancement" (LACE) meant to provide better viewing of displays when outdoors in sunlight or in a room with less than desirable lighting. Additionally, all Pentium Silver and Celeron processors will ship with Intel 9560 AC using 160 MHz channels. Intel states that doubling the typical 80 MHz channel width offers the ability to download an 8GB movie in under a minute making it nearly twice as fast a a standard 2x2 802.11AC adapter. Using 160MHz allows for up to 1733 Mbps of throughput compared to 867 Mbps with 80MHz of bandwidth. A key advantage to lower tier processors is reduced power consumption. For devices with a 35WHr battery, you will be able to watch up to 10 hours of 1080p content locally. 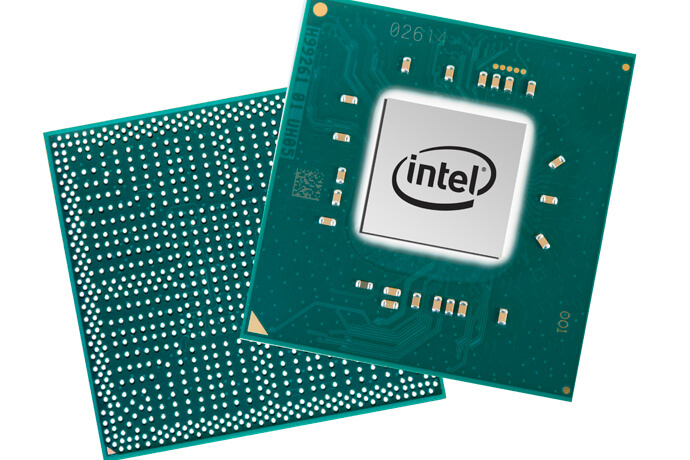 Compared to similar tier CPUs from four years ago, Intel claims this new generation offers a 58% performance increase without a noticeable reduction to battery life. Laptops, 2-in-1s, small form factor PCs, and all-in-one computers will be available from OEMs with Pentium Silver and Celeron processors during the first quarter of 2018.